OPC DA Server는 Windows Platform을 기반으로 하고 있어, OPC Server, Client가 서로 다른 PC에 있을 경우 DCOM를 이용하여 통신해야 하고, 원격지에 있을 경우는 WAN을 통해 연결해야 하므로 NAT (Network Address Translation)을 이용해야 하는데, DCOM 은 NAT를 통과하지 못하고, 또한 DCOM 연결을 위해 사용하는 TCP port 135는 잘 알려져 있으므로 보안에 취약한 면이 있다. 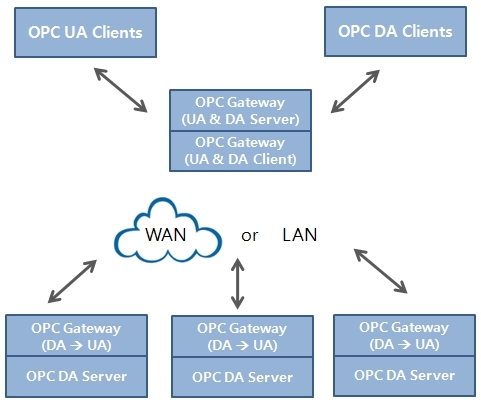 Edge to Cloud Data Connectivity가 보편화 되고 있으므로, IIoT의 표준으로 자리 잡은 OPC UA (Unified Architecture)를 이용하면 OPC Classic 표준이 갖고 있는 위에 언급한 한계와 단점을 극복할 수 있다. OPC DA Support – connect to OPC DA servers and clients. OPC UA Support – connect to OPC UA servers and clients. Includes both client and server interface for both UA and DA. Maintains the OPC UA data model, while other gateways flatten it. Automatically discovers all the points from the server. One key advantage of using the DataHub OPC Gateway is that the data model stays intact, unlike other UA/DA gateways. The full data hierarchy from the OPC UA server gets faithfully represented in the OPC DA client. Conveniently, the DataHub OPC Gateway can replace the client side of any OPC UA-based tunnelling solution. Doing so gives you convenient configuration options and a better replica of the original OPC DA server’s data hierarchy. You don’t have to select all the points you want to read from the server, let the DataHub browse the whole data set. This is more robust if the data set changes on the next run, the DataHub will figure it out.